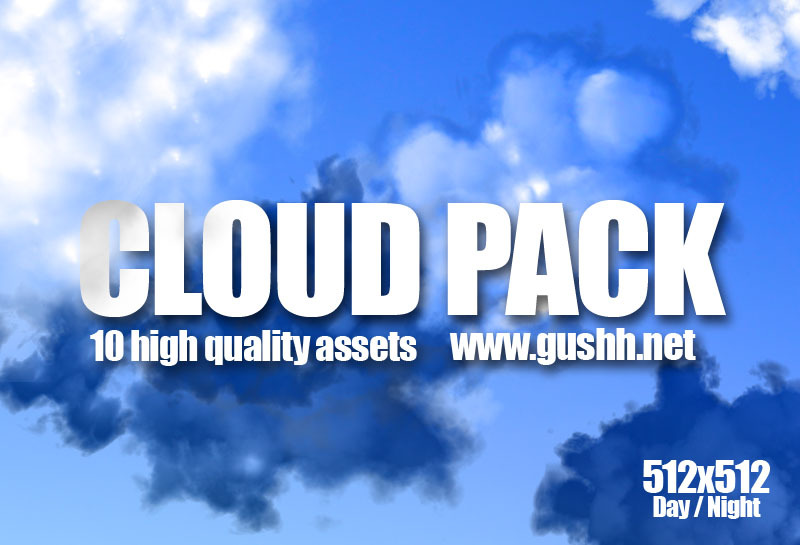 Free Game Resources – Cloud pack with full alpha channel. It’s been a while since I shared some of my game development related artwork, but here’s a nifty set of volumetric cloud samples I’ve made for one of my projects, the various shapes contained allow to create a vast amount of variations rather easily. These images contain full alpha channel and are all 512×512. Some of the clouds have a dark background (night) — Others are daylight based, however they can be mixed using various rendering and blending methods to obtain rich pseudo dynamic clouds at a low processing cost. An ideal blending method would be to utilize the luminosity of the samples to blend against an existing background, then through the use of layering and clever movement quite interesting cloud representations can be achieved for games and simulators, and why not a screensaver?. These samples are free of use for non commercial projects, however credit must be given. If you need a complete set, higher resolution renders or other custom work — Feel free to contact me for extra details!. Also, feel free to send in your suggestions for future freebies, I’m open to a challenge.